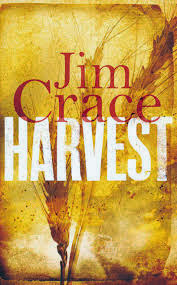 Before the publication of the Booker-shortlisted Harvest, Jim Crace said he thought it would be his last novel, which somehow makes this book about a middle-aged narrator witnessing the end of a long-standing way of life and struggling to come to terms with it even more poignant. Walter Thirsk, an inhabitant of a tiny, unnamed English village in an unspecified period, is something of an outsider, even though he's been resident for many years and was, until the death of his wife, married into one of its longest-established families. Walter is an astute observer with an eye for the bigger picture - perhaps this is what makes him the ideal assistant to the chart-maker who has arrived to map out the land on which the villagers scratch out a living communally under the direction of a manor-dwelling landowner. Walter has never seen a map of his village before despite his intimate knowledge of it (similarly, he hasn't seen his own face for over a year because nobody in the village owns a mirror) and is fascinated to see its shape unfolding on the chart-maker's page. Yet seeing the land mapped out also contributes to the sense of dread which pervades Harvest, as it's clear that the land is to be 'enclosed' - fenced off for sheep-farming instead of cultivated for crops and cattle - and that this will change the villagers' lives forever. Harvest is not just a novel about the end of an era. It's about fear, suspicion and guilt, and the effect these have on the behaviour of otherwise decent people. Innocent strangers from another village, themselves victims 'of sheep', are pilloried without mercy for a crime the whole village secretly knows they didn't commit; family members tortured by the new landowner's stewards are abandoned to their fate. Walter's own position on the edge of the insular, 'thicketed' village community is a constant source of anxiety to him, and it's ironic that he and the other outsiders might just find themselves the last people left who can keep the village alive. Crace's prose is astonishingly good, peppered with arresting and original imagery that gives Walter a distinctive and peculiarly convincing voice. It's fair to say that, despite the magnitude of the change that comes over the village during the course of the novel, this isn't a fast-moving narrative and many of the most dramatic events take place off the page, but I found Crace's writing such a pleasure to read that I didn't mind this at all - and in any case the sense of anxious dread that builds throughout creates tension in itself. Some have also criticised this novel for its non-specific historical setting and hence a perceived lack of 'accuracy', but this isn't intended to be a historical novel; it's more than that, and explores themes and truths about human nature that would be every bit as relevant if the setting was a contemporary one.